Step right up and enjoy at these amusement park and carnival type rides across Atlanta! 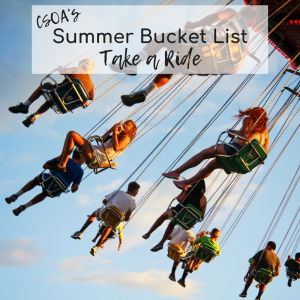 CSOA has put together a list of rides that will satisfy thrill seekers of all ages. Rooftop revelry and splendid scenic vistas are NOW OPEN to everyone! Skyline Park is bringing old-timey fun to the heart of Atlanta, Georgia. Perched high above the hustle and bustle of Ponce de Leon Avenue on the top of the magnificently restored Ponce City Market, Skyline Park is quickly becoming a premium destination for those seeking delicious food, refreshments, and good times for all ages. Come from near or far to delight in carnival amusements, and marvel at the breathtaking views of our fine city. Learn More. Thrill Capital of the South. Park features more than 40 rides and attractions, including THE JOKER Chaos Coaster, Goliath and 9 other world-class coasters. NEW for 2018- Twisted Cyclone coming Memorial Day weekend. Ask Your Concierge About Discounted Offers for Six Flags Over Georgia. Towering nearly 20 stories above Centennial Park, the SkyView Ferris wheel features 42 climate-controlled gondolas providing guests with breathtaking panoramic views of downtown Atlanta and the surrounding metropolitan area. Those looking for an even more enhanced experience will enjoy our VIP gondola boasting Ferrari style seats, glass floor and a longer flight time. With our convenient location just steps from many of Atlanta’s most popular attractions, SkyView Atlanta is the perfect compliment to your downtown adventure. Learn More.